The objective of this study was to characterize and quantify the genetic diversity within and between species of the genus Macroptilium with potential in animal feed, through morpho-agronomic descriptors. Sixty-four accessions of three species were used. The experimental design was randomized block design with three replications and five plants per plot. Eighteen qualitative and six quantitative morphological descriptors were used in addition to six agronomic descriptors. Quantitative data were submitted to analysis of variance and means were compared by Scott–Knott test, at 5% significance. For the divergence analyzes all the descriptors were grouped based on the Gower algorithm. The dendrogram was obtained by the UPGMA hierarchical grouping method and the relative importance of the characters was calculated for the divergence. There was significant effect for most quantitative traits and high variability for both between and within the studied species. Seven groups were formed which were grouped mainly in relation to the species. Groups IV, VI and VIII formed by accessions of M. atropurpureum (Sessé and Moc. ex DC.) Urb. have characteristics of interest for animal feeding. CTM-S04 and CTM-S07, not taxonomically classified, were allocated to these groups. 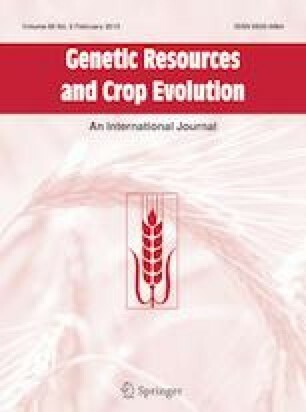 The accessions that presented the greatest potential for animal production were CTM-A16 and CTM-M8, because they presented high dry matter production and high leaf:stem ratio. These accessions were superior to the cultivar Siratro (CTM-A27) with respect to these descriptors. These results indicate that the genotypes showed variability between and within the species which make possible their use in programs of selection and breeding for animal feed. We thank the support to the Coordination for the Improvement of Higher Education Personnel (CAPES) and all colleagues for their help with the laborious field experiment. In memory of Claudio Mistura without whose support this study would be much more difficult.